The unmanned X-47B flew in the carrier pattern with manned aircraft for the first time during testing aboard the USS Theodore Roosevelt. X-47B in flight after first-ever catapult launch from USS George H.W. Bush in May 2013. 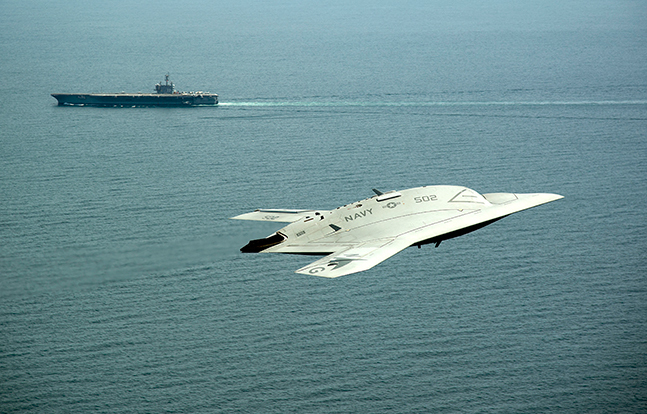 The U.S. Navy’s X-47B finished the last of its testing aboard the USS Theodore Roosevelt last week. While underway, the X-47B flew in the carrier pattern with manned aircraft for the first time and conducted a total of five catapult launches, four arrestments and nine touch-and-go landings, including a night time shipboard flight deck handling evaluation. 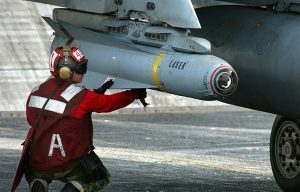 Testing began Aug. 17 when the X-47B performed its initial cooperative launch and recovery cycle with an F/A-18. With its automatic wing-fold capability and new tailhook retract system, the X-47B met the program’s objective to demonstrate that carrier-based manned and unmanned aircraft could maintain a 90-second aircraft launch and recovery interval. The U.S. Navy will continue testing at Naval Air Station Patuxent River.